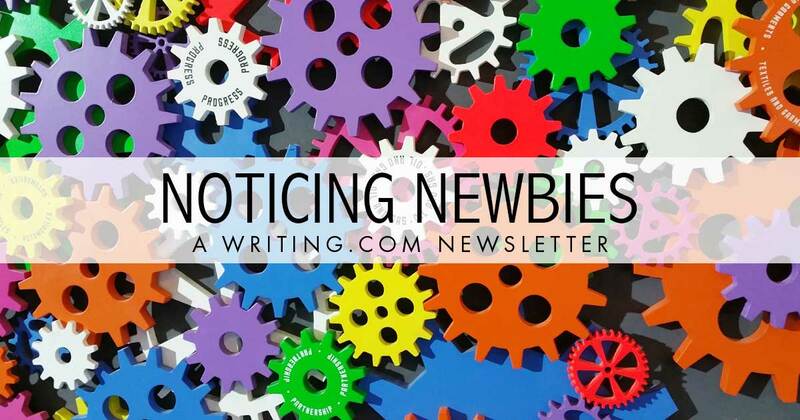 The Noticing Newbies Newsletter's goal is to make the newer members feel welcome and encourage them with useful information and/or links to make navigating Writing.com easier. Writing.com members of all ages and even veteran members can find useful information here. If you have specific questions, try visiting "Writing.Com 101" and/or "Noticing Newbies" . In the past few editorials, I've been exploring what makes inspires you. We started with what prompts tickle your fancy in "Writing Prompt Poll" , evolved to "What Prizes Are You Wishing For in 2019?" and last month we explored your "Favorite Type of Writing" . I found your votes and commentary very interesting and I thank each and every person that voted and/or wrote in to participate. This month I'd like to say the juxtaposition of these views is what makes this site so amazing. What inspires one writer may stifle another. Using myself as an example, let me explain. I started participating in a very popular writing challenge here that challenges you to write something every week for the entire year. For someone who has written perhaps a handful of items in the past year, this was a daunting task to undertake. In beginning the challenge though, something continued to stifle my creativity. That was the clause that each item must be submitted to a contest here on the site. Now, in chatting with a fellow writer on our Wdc channel on Discord, I discovered that is precisely what excites her about this same challenge. This is exactly what I'm talking about. While the contest aspect stifled my creativity, (I was still writing but couldn't find an appropriate venue to enter my work), my friend was excited by the chance to enter her work in multiple challenges across the site. What about entering contests stifled my creativity you ask? Rules. In a nutshell, there was always something that made what I wanted to write ineligible or not fit the mold. I think this falls into the same categories we've been discussing for the past few newsletters. I'm generally not a prompt-inspired writer. Oddly enough, I'm not inspired by prizes usually either and I know I'm in the minority on that. So, how do we find a happy medium? I think this is one of the things that makes this site so wonderful. There is a myriad of different contests to inspire those that have brains that work that way. Plus, in the off chance you don't find one that inspires you, you can create your own challenge. If you feel this way, chances are there are others that feel the same. This is precisely what I plan to do. I will create my own. This month's links are creative items that challenge us from our community. Come answer a question, share a laugh, encourage one another, and bring me a coffee! This month's highlighted author's are members who responded to the prior editorial either via the comment section below or via email or review. A beginning look into a world in which the woods are not to be trusted. Unbeknownst to him, this particular sign was not an informational placard, but a form of warning. Decomposing and tagged over, the sign held words that the locals told their children to scare them at bedtime: “Many fear to enter/ the fabled gilded wood/ for few seem to exit/ where one truly should,” Though to be fair, even if Elie had made the effort to read the words under the ink he wouldn’t think much of it. He was never one to believe in fables, folklore, or fairy tales. How ironic that he was to become one himself. Fascinating, really. A walk in the dark brings fear and unexpected friendships. Proposed first chapter for as-yet untitled sci-fi, mystery. The Morose, a small, unremarkable vessel, set about what should have been an uneventful launch across Delta Quadrant. In the vastness of charted space, Delta was the only one not inhabited by humans or other known intelligent species. The planets were too frigid, too arid or too toxic. In other words, ideal for smugglers. A poem about the traveller who wanders around. Gil was actually excited about his employer transferring him to another city. He often heard coworkers complain about it, but most of them had families and houses and things like that to stress out about. As a single renter who had never ventured out of Minnesota, the idea of experiencing a life in a different part of the country was exciting. Especially a place like the famously good-weathered great state of California. As much as Gil loved his hometown of Minneapolis, he was actually looking forward to trading in the cold winters and heavy precipitation for sunny beaches and ocean breezes. Reap the riches of the land--Harvest Time is here. There's the scent of Autumn in the air. It is the ripe season of Harvest Time now here in Mid-Michigan. The farmers reap the riches of the land. We all will enjoy the cooler air after a long, hot growing season. Spending money on the produce boosts the economy. Canning the produce to last one year's time stretches your dollar. Based off of my Monster Cowboys series, "Monster Cowboys The Book" , you take the reins of someone in this Western/fantasy-style interactive, in which humans, monsters, technology and magic live side by side in the Old West. You could be anyone you want, from a cowboy driving cattle to market, and battling rustlers, to a townsperson in a western town, to an outlaw who preys on the hard working and honest folk, to a Native American watching as Anglo-American Monsters and humans encroach on your tribe's traditional hunting lands. I received some wonderful feedback to my last newsletter [#9322] "What Type of Writing Do You Choose?" commenting on the topic and also a question from a fellow member asking "I would like to see the editor's view on how Interactive Stories help or hurt a writer's developing skills." You're going to be great at this year's writing challenge! I can't wait to start reading your work again! You're always so supportive. I can't tell you how much it means to me. I marked "other" because for me it depends on how much time I have. If I only have short bursts of time to read I tend to read more short stories and articles but if I have some longer breaks to read in I will tend to read novels. I will also read a novel if I just need to escape. It will usually be one that I have read before if it is a bad time. Kind of like having a comfort blanket. I can totally understand that. I am that way with the TV series Moonlighting actually. I trust this is the intended means to respond to your request for feedback concerning interactive stories; if not, please tell me what I should have done instead. Pressing forward, I recall creative exercises in school where we would start writing a story and then at random times the teacher would have us pass our stories to the person in front of us. Oh, the excitement I'd feel as I'd read someone else's twist on the story in front of me. I'd voraciously read everything and then would inject some seasoning of my own. I'd spice things up with my interpretation of how would I change the mood of the story? Timing? Twist? Maybe one could think of it as something like a jam session: we know the given key, the timing and the starting note. Now mix in the perspectives of the players and we get something amazing. So, in my opinion, such interactive stories keep the story teller alert to new ideas from others and provide ample opportunities to explore--and exercise--different means to their writing craft. Gosh, this was fun. Thanks for the chance to say something. I think that makes total sense and I agree completely! Thank you for writing in and sharing your thoughts. Anything. When I started, my interest straddled the line between science fiction and fantasy, but nothing in that world ever materialized. After many fits and starts, I wrote a contemporary novel, "Delta Blue," about a police officer and novice prosecutor preparing a murder case for trial falling in love - forbidden love. I've also begun a few works in progress. One is a comical time travel adventure that mixes real U.S. and Mississippi history with historical fiction/classic literature and general foolishness. The other involve space travel, treachery and one man's effort to get his life back after being declared dead. Varied interest is important in a writer. Read, read, and read some more I say! Generated in 1.42 seconds at 6:10am on Apr 25, 2019 via server S30.